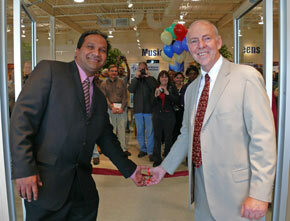 Kern Kalideen (left) and Larry Willard open Faith Family Books and Gifts in Scarborough, Ontario. Close to three dozen Canadian Christian bookstores have closed in the past twelve months, but that didn’t stop Larry Willard and two of his partners from officially opening a large new store in Toronto over the weekend. 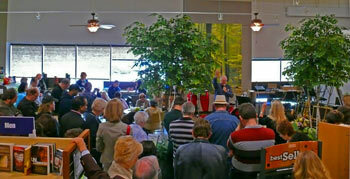 “God is opening a window at an unusual time,” said Willard, who admitted that the new store represents a big risk. Faith Family Books and Gifts is located in the high rent Town Centre Plaza in Scarborough, one light north of Highway 401, in one of the busiest corridors in the Toronto area. And, with 11,000 square feet of display space and about 2,000 square feet of warehouse space, it is much larger than many other Christian bookstores in Canada. If the opening day is any indication, the risk is paying off. Willard said he prefers to see it as God’s affirmation of a faith venture. Between three and four thousand customers crowded into the store, with some lined up to get in when the store opened and others still packed into the store at closing time. One-day sales were about $26,000, a good monthly total for some smaller stores. Faith Family Books and Gifts bought some inventory and equipment from the bankrupt Mitchell and hired some of its experienced staff. Still, said Willard, it was easier to start something new than it would have been for Mitchell to change the approach in already existing stores. The new store, said Willard, will not operate as a “traditional” Christian bookstore but more like “a Christian community centre, a hub of Christian activity” — a place where Christians will meet their friends and youth groups will meet for coffee on Friday and Saturday nights. The store has a cappuccino bar and coffee shop with seating for 40, but it can be expanded to accommodate 80 to 100 for mini-concerts by Christian bands and singers and book signings and talks by authors. Five groups played on opening day, and ten authors signed books. An expanded range of products will also be offered: a broader range of books, including books by Canadian authors; more gifts and original Canadian Christian artwork; Christian music; and books and other products for children. Faith Family Books and Gifts also plans to directly challenge competition from online booksellers and big box stores, which sell books by the most popular Christian authors at discount prices. The store will do this partly by buying larger volumes of books at better rates from publishers and distributors and cutting its own profit margin. It also plans to expand its website to handle internet sales. The store will also use a variety of innovative marketing techniques, such as radio, TV, flyers, email blasts and an expanded website with blogs by experts recommending various books. Customers will receive points for their purchases which can be used by their pastors to buy theology books. The 12-foot-high ‘Faith’ on the store’s sign is visible from Highway 401 a block away and has already brought in customers who didn’t know about the store before. All of this is possible because the bigger store has critical mass, said Willard. Like a mega-church, it can offer a wider variety of services. The three partners who own the store bring a high level of professionalism to the company. Willard, the president, has years of experience in publishing and business. He is the owner of Castle Quay Books Canada and BayRidge Books and has just finished nine years at Tyndale University College and Seminary, where he served as vice-president. Kern Kalideen, the chief financial officer, is a certified accountant working as a director in the strategic risk management department of a large financial institution. Paul Fredericks, the vice-president of business development, is founder and president of Inspire Brands, a company that manages and operates 15 restaurants across Ontario. Faith Family Books and Gifts may symbolize a new trend in the Canadian Christian bookstore industry. To some extent, it is modeled on the House of James in Abbotsford, BC, which just opened a $1 million expansion, including a revamped coffee shop, giving it about 12,000 square feet of space. It also features weekly concerts, website sales, blogs and innovative marketing. Lando Klassen, owner of the House of James, said bigger stores may be the wave of the future, but the key is still personal interaction between the bookseller and the customer. Christian bookstores have to offer something more personal than the websites and cheaper books of the mainstream competition. The bookseller has to know customers in order to meet their needs. Mark Hutchinson, owner of the Blessings bookstore chain, which faced bankruptcy last year and cut back from 24 stores to three, told CC.com the chain is now experiencing growth by doing many of the things that Faith Family Books and Gifts and House of James are doing. The three remaining stores — in Edmonton, Calgary and Langley, BC — are offering a wider range of products (including more book titles and more DVDs), better prices, faster turnaround on special orders, giftware and tickets for community events. The three remaining Blessings stores are all fairly large, ranging in size from about 6,000 square feet to 10,000 square feet — without coffee shops. Hutchinson and Klassen agreed that only larger stores in larger communities of 40,000 to 50,000 people can do the things they are doing. But there are exceptions, Klassen added, noting that some smaller stores in smaller communities are doing well as long as they are very well run.